Quilted Luxe JL Duffel Bag Available In 2 Sizes. Mini For Small Dogs Up To 8 Lbs. Or Regular Size For Dogs Up To 15 Lbs. 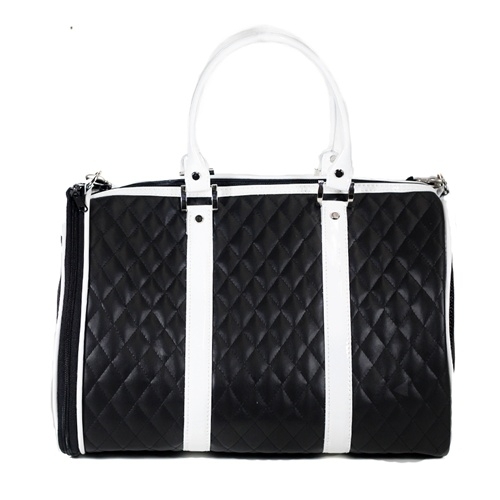 Black and White Quilted Luxe JL Duffel Bag - A stunning new addition to our collection of designer dog carriers. We love this graphic black and white quilted duffel style pet carrier from industry leader Petote. This stunning new Petote bag is made from soft quilted black faux leather and trimmed in stunning white faux leather. This dog bag is not only lightweight and roomy, but also super stylish! This quilted dog bag is quickly becoming one of our most popular style pet carriers! Our JL Duffel Tote is available in 2 sizes. Choose our mini duffel or our regular size duffel bag. Mini JL Duffel measures 16" L x 10" H x 9"W. Mini tote will fit dogs up to 8 lbs. Regular Size JL Duffel Tote measures 18" L x 12" H x 9" W. Regular size duffel will fit dogs up to 15 lbs. Petote Dog Bags are proudly designed and manufactured in the USA. Shop the entire Quilted Luxe Collection.